The Pulp Factory'sr Bobby Nash was interviewed by Morgen Bailey for her writing blog site. The Pulp Factory's Bobby Nash is the guest blogger over at author Rachel Hunter’s Life Defined blog today. Bobby tackles an issue he faced recently, creating a compelling novel cover. 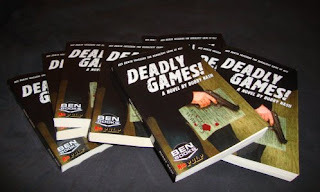 He goes through the steps it took to create the cover to his latest thriller, Deadly Games! Airship 27 Productions announces the release of their latest title and the second in their series of adventures starring Dr.Watson, the brave, stout hearted ally and companion to the World’s Greatest Detective. When Sherlock Holmes, who was presumed dead at the hands of his arch nemesis, Professor Moriarty, returned in the story Dr.Watson chronicles as “The Adventure of the Empty House,” we were told how the Great Detective had spent the intervening years abroad in disguise as a secret agent for England. For the devoted Holmes fan, that seemed sufficient to close this chapter of the duo’s life and move on to new adventure. But when a heavy locker box arrives at 221 B Baker St. from the United States addressed to Dr. Watson, it is Holmes who finds his curiosity piqued. What is in the mysterious box? Who sent it and why? Holmes summons his loyal companion who in turn sets about telling Holmes of his own unique adventure abroad during his hiatus. What follows is an amazing mystery involving Watson’s lovely wife, Mary, and her family history. The answer to the puzzle rests in the foothills of the Adirondacks of upper New York State and the couple soon set sail for America, Mary hoping the trip will pull her husband’s mood from the gloom in which it was mired since the supposed death of Holmes. Once in New York, they encounter the vibrant, colorful civil servant, Teddy Roosevelt, who provides the vital clue that triggers the Watsons' quest? From the majestic peaks of the Adirondacks to open plains of the wild west, Erwin K. Roberts spins a fantastic, rip-roaring yarn that will have Holmes and Watson fans cheering from the first page to the last. 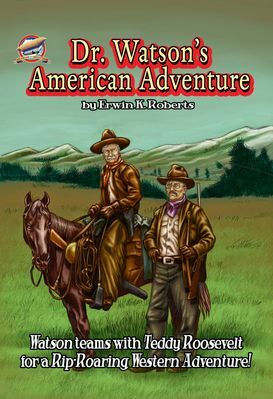 Featuring interior illustrations by artist Pedro Cruz and a colorful cover by Rob Davis & Shane Evans, “Dr.Watson’s American Adventure” is a rollicking grand adventure in the classic pulp style. This volume also features a special PULP Bonus; “Hyde and Seek” – brand new adventure starring her Majesty’s Secret Agent, Hound Dog Harker by Aaron Smith. In March, Airship 27 launched its 45th title (the 4th of 2012) about a 1930’s pulp detective named Rick Ruby. 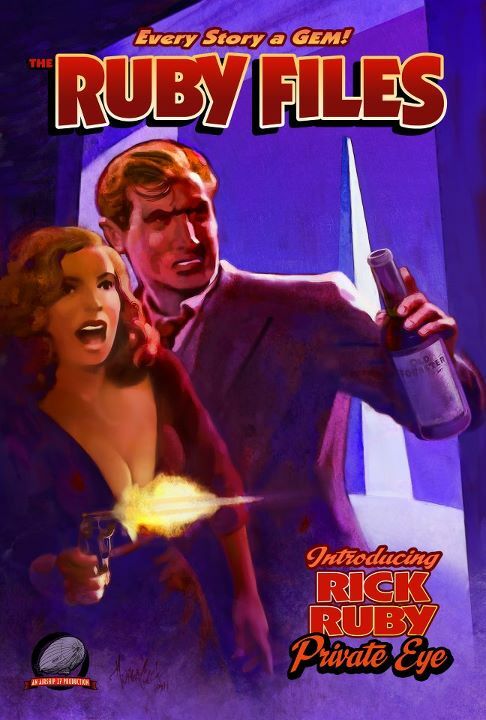 Co-created and written by Bobby Nash and Sean Taylor, The Ruby Files also sports tales from writers Andrew Salmon and William Patrick Maynard. Interior art by Rob Moran. Cover art by Mark Wheatley. New pages were added to the official Lance Star: Sky Ranger website at http://www.lance-star.com/ and the official The Ruby Files website at http://rickruby.blogspot.com/, which gives links to shows, conventions, signing and other appearances made by creators who worked on those title. Meet The Ruby Files Creators. New Appearances page added. 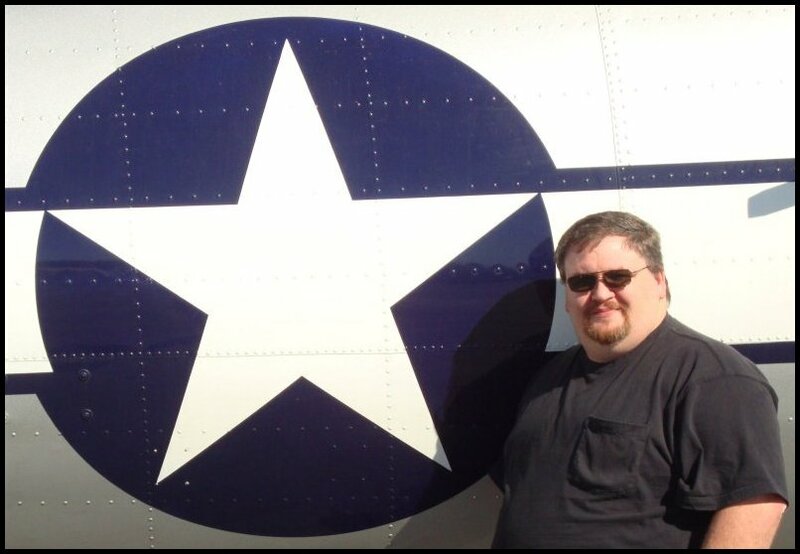 Meet Lance Star: Sky Ranger Creators. New Appearances page added. If you’re at any of these shows, please stop by and say hello. These creators would love to meet you. Tell them The Pulp Factory sent ya! LANCE STAR: SKY RANGER "ONE SHOT!" FLIES ONTO iTUNES! The Lance Star: Sky Ranger comic book, “One Shot!” by Bobby Nash and James Burns arrives on Apple’s iTunes store for immediate release. November, 1941. Ace Air Adventurer Lance Star accepts a dangerous mission into an enemy stronghold to stop the Nazi’s from uncovering plans for a weapon long believed destroyed. Lance flies a solo mission to Kiev where he is to plant explosives and destroy a weapons facility when he runs into an old enemy. Now, Lance is faced with a choice. Complete the mission? Or take down the Sky Ranger’s greatest adversary? He’s only going to get one shot at this. Will he choose the mission or revenge? Featuring high-flying adventure, aerial dog fights, explosive action, and stunning artwork, Lance Star: Sky Ranger “One Shot!” is pure pulp fun from start to finish. Host Tommy Hancock brings on a whole herd of Pulp Cats to talk about Airship 27 Productions' latest original anthology - THE RUBY FILES! Listen as Ron Fortier, Rob Davis, Bobby Nash, Sean Taylor, William Patrick Maynard, Mark Wheatley, and Andrew Salmon discuss noir, hard boiledness, gumshoes, dames, and more! Learn about the creation, writing, and art behind this brand new chapter in the history of Private Eye Pulp! 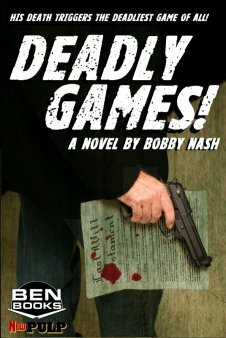 One of the busiest people within the New Pulp movement is author Bobby Nash. Amongst his credits is co-creating and contributing to the new anthology from Airship 27: The Ruby Files. Bobby was nice enough to take a few minutes out of his busy schedule to grant The Free Choice E-zine an interview. New Pulp Author and The Ruby Files co-creator, Bobby Nash was the first guest for the new The Random 10 interview segment at the A Bit Too Old For Comics? blog. I wrote a blog post answering a reader’s question. Is Deadly Games! a stand-alone book or part of a series? See my answer along with some never before seen Deadly Games! photos at http://www.bobbynash.com/ and http://ben-books.blogspot.com/.